It seems like every business out there runs a promotion for Black Friday or Cyber Monday or both — but is it really worth it? Can you stand out amid all the hubbub and actually make a difference for your business? I waited much longer than I care to admit (longer than I should have!) to run my first holiday promotion in our businesses, but as soon as I saw how profitable they could be, I was hooked. I honed our system to precision so that hosting sales and promotions in our business became much more effective at generating revenue each and every time. For a few more days, I’m offering my Holiday Sales Kit — with access to EVERYTHING (yes everything) that you need to host a successful sale, including the strategy, emails, graphics, and social media posts — as a standalone product. Click here to learn more! But you don’t have to take my word for it that this system works! Here are three real stories from three real women in business just like you, and how they used my Holiday Sales Kit to dramatically improve their sales revenues. MamaSuds helps ingredient-savvy women who want to create a safe, non-toxic home by using environmentally conscious products. Owner Michelle Smith sells handcrafted castile soap, body wash, all-purpose cleaner, dishwasher powder and laundry soap. Before going through the Holiday Sales Kit, she ran promotions haphazardly, running discounts whenever sales were slow. The result was that she attracted “coupon shoppers” who would wait and only buy with a discount. After she implemented the training, she realized how much more planning and organization needed to go into running promotions and sales. “It really helped me realize you need to bring value to your customers [through a sale], not just slashing your prices,” Michelle said. The majority of people do exactly what Michelle was doing, but it’s so important to understand the psychology and strategy that goes into a proper promotion — and the difference that can make. Michelle is living proof: Her first year using the Holiday Sales Guide her sales were up 54 percent, and the second year, her Black Friday/Cyber Monday sales were up 115%! Obviously, anyone can host a sale on their own, but it’s the psychology and process behind our sales strategy that makes the difference. The Holiday Sales Kit includes my $100k sales formula — the exact system I created and use year-in and year-out to hold sales that regularly exceed $100,000 in sales over a Black Friday weekend. This same system has been used by hundreds of my students to generate record sales in their businesses — and yours! Before going through the Holiday Sales guide, Leah Emmot ran her first Black Friday sale for her inspirational apparel company and made $10,000. She was very happy with the results and rightfully so! But after she implemented what she learned in the Holiday Sales Kit, she was able to 6x her revenue over Black Friday weekend — more than $60,000 in one weekend! Previewing the sale to her customers to build anticipation with a VIP list was a huge driver for her sales. “Those 20% of people will bring you 80% of your sales!” Leah reminds us. Even though her VIP list was only a few hundred people, they were the biggest revenue drivers for her sale. Remembering to focus on your best customers and giving them an opportunity to feel like part of an elite community is a key part of the Holiday Sales Kit that pays off both in revenue and customer satisfaction. Tessa Hartnett runs MensRingsOnline.com.au and her business does what it says on the tin, but she had never put much stock in collecting emails or email marketing before diving into the Holiday Sales guide. They had tested single “sales” emails before, but had no success with that, so she was very skeptical that a promotion, driven by emails, could work for her business and her small list. But she was willing to give it a try. After implementing the Holiday Sales system for a Valentine’s Day promotion, however, Tessa was a convert. Even with a small list, she saw big returns. It gave her the confidence to continue doing email marketing, sales, and promotions in the future and just keep improving and growing those sales. What’s most amazing about Tessa’s experience is that she decided to host her Valentine’s Day sale just a few days before the holiday! She literally put together her sales campaign and graphics the night before — and even with so little lead time, her sale was a success. “The swipe files in the Destination Guide were the key to getting it out so quickly,” she said. In addition to giving you the exact sequence of emails and instructions on precisely when to send them in order to maximize your sale, the Holiday Sales Kit also includes my word-for-word swipe copy, which shows you exactly how I communicate with my customers in order to generate a ton of buzz and drive sales. Plus, by adding a pop-up advertising the sale, she managed to double her list in the first days of her sale and that list converted at more than 25%! The key, as Tessa realized, is just to get started, and we’re making it easier than ever for you to get started. 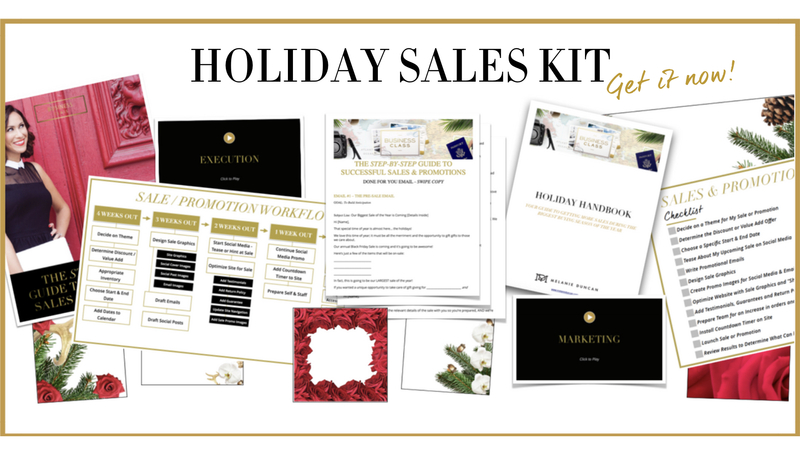 Click here to order your Holiday Sales Kit now — or enroll in my hands-on workshop to get valuable feedback on your sale directly from me. But hurry! The holidays are just around the corner!